Issue with displaying 5 digits? Thread: Issue with displaying 5 digits? Hello, first off thanks a lot for the wonderful work you did on the spreadsheet. By far the best i've come across. I'm having a problem with a pretty small display issue. 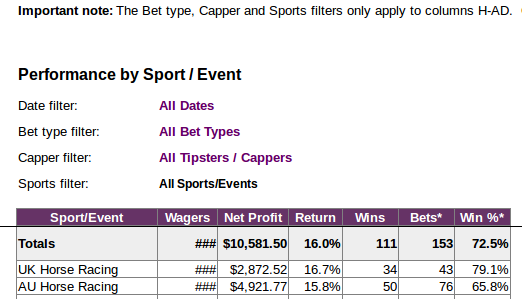 On the "Performance Summary" page, a 5 digit figure is not being displayed under the "Wagers" tab due to lack of enough cell width. Is it possible to fix this issue? EDIT: I came across this post and was able to unlock the sheet and amend the cell width. Thanks and sorry for creating a thread without enough research. Last edited by RaJaM; 13th November 2017 at 06:04 AM.